I found a short thread about building a smoker and I thought that I'd expand from that to a thread that included Everything about Making Sausage and Smoked Meats. Equipment, Processes, Meats, Techniques, Finished Products and Recipes. 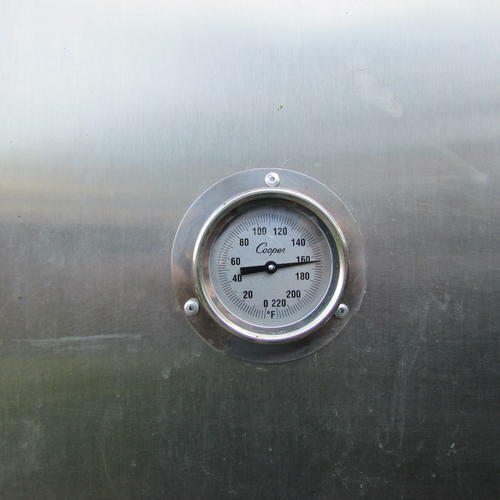 I started out with a steel barrel that had held a solvent that was very close to simple Briquet Starter. It sat on end and I had a friend use his special air tool to cut out the top and then removed all of the sharp points. And to be on the safe side, I washed the inside and out with soap and water and rinsed it well; then filled it with crumpled newspaper and fired it up and then re-washed the drum. 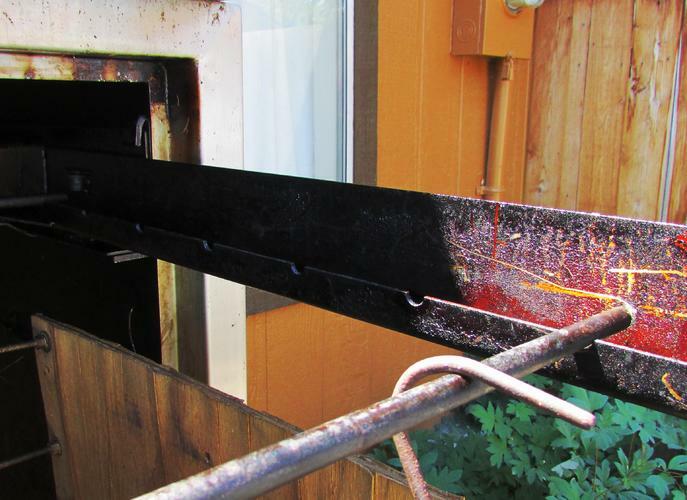 I then used 5/16" rod to allow a simple used charcoal grill to sit on for things like jerky and salmon. I also installed the same size rod above so items like sausage could be hung down. I wish I had pictures but it worked good for a few years. Then I modified an old '40's refrigerator and used that for a several years (it worked better). So here's my current smoker. 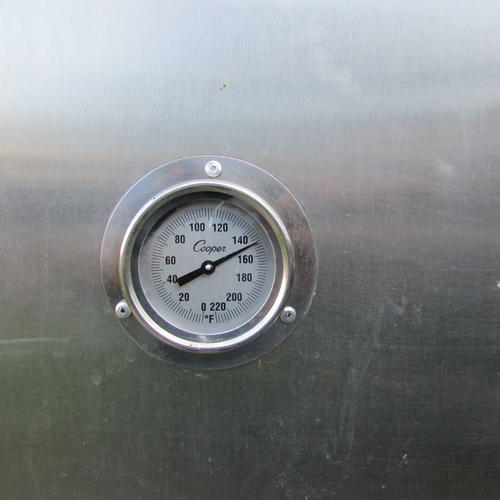 It's Stainless Steel and originally designed to cook BBQ for our China/Deli however while it had been plumbed in (natural gas powered) and test fired, it was never used. After sitting idle for several years the District Manager told the Store Manager to have it hauled to the dump. Knowing my love of smoking meats the Manager asked me tongue in cheek; ' Would-you-like-to-haul-it-to-the-dump' and I replied 'Sure; I'll-haul-it-to-the-dump' On my next day off I disconnected the gas line and with the help of about 3 other guys we laid it down on it's side on a pallet and then took it outside where we used a double stacker to load the unit in my pickup. After getting home I had to call friends to help me get it in the back of my place. I removed the gas burner and the thermostat (it went to 700 degs) and modified to to use electric. Over a couple of years I've got it to where it's an excellent smoker. It came from the factory with a sliding unit. I made a 'rack' out of some scrap wood and some all-thread that would hold some screens for making things Jerky or Smoked Salmon. Thanks for looking : This should be fun! gssixgun, ScoutHikerDad, 32t and 15 others like this. I've just bought a smoker, nothing as fancy as that, when I ripped out and re-landscaped the back garden (hiatus due to a diy binge). I'm just starting and have done a couple of brisket and some ribs. That looks immense. Far beyond my ability to build. 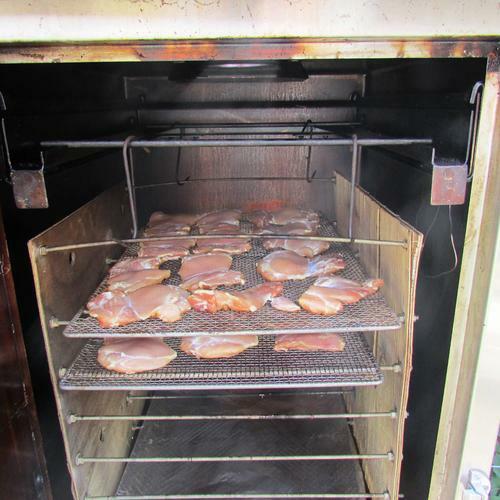 You'll have to put up some pictures of your smoked masterpieces. lz6, ScoutHikerDad and cudarunner like this. Never trust a man who, when left alone in a room with a tea cosy, doesn't try it on! 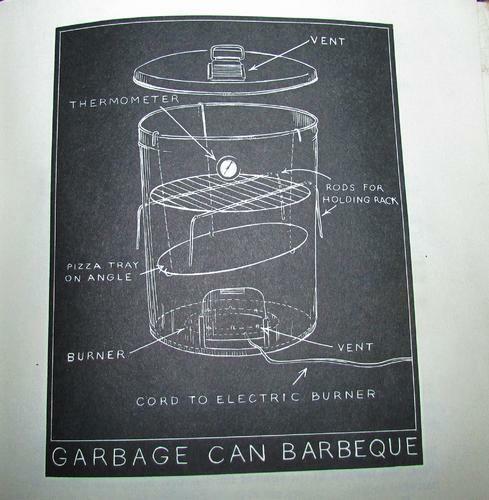 As I said I started out with a metal barrel/the design for that came from a cook book author who had made his out of a brand new metal garbage can. Also, I didn't 'build' this smoker I converted a factory build to my needs. 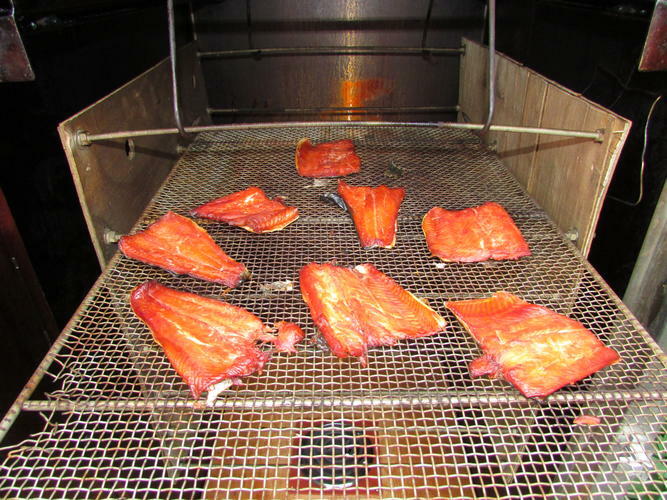 Here's a pic of some smoked salmon that I did recently. ScoutHikerDad, Firefighter2, Hirlau and 5 others like this. Very impressive, Roy-I just make do on my Akorn kamado smoker, aka "poor man's Egg." It sure puts out some juicy brisket, ribs and pulled pork, though! 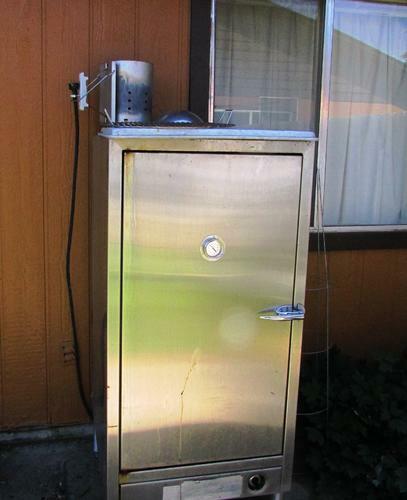 I've been thinking about rigging up one of those filing cabinet smokers. 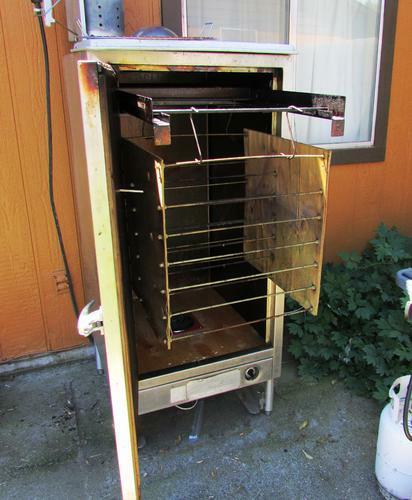 You're a lucky guy to have a smoker of that size and function. "Taking it to the dump" saved you thousands. Part of me wants something on that scale and the sensible part of me knows I don't have the mouths for all the food it would be good for. And it has to be easily moved because I don't have a back yard. But I was just mentioning to my wife that we need to get some bacon going. We've been out of it for awhile now and its time. Probably in the next couple months I'll get into that again. Then comes duck....then salmon. Just to file things away properly, here is my last smoker project for anyone who hasn't already seen it in the dinner thread. ScoutHikerDad and cudarunner like this. One of our local chain stores (Albertsons) had boneless skinless chicken thighs and or breasts on sale at $1.47 per LB. 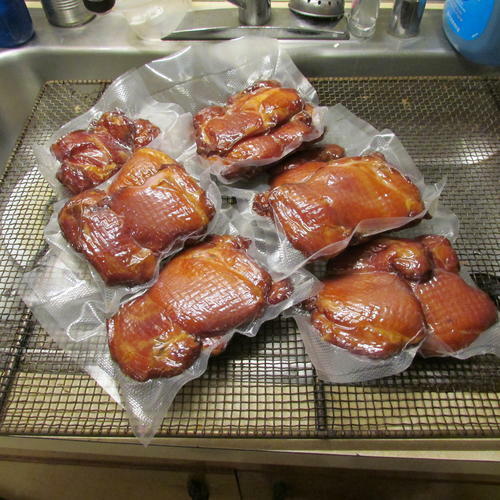 So I picked some thighs up, got the excess fat off, trimmed them up a bit and got them in a curing brine for 30+ hours. 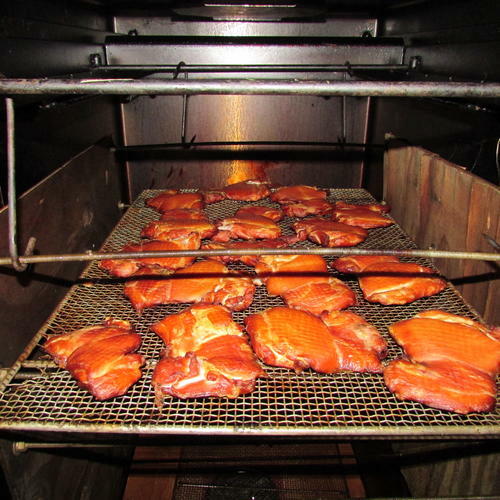 To make smoked meats, you need something that will 'smoke' like damp wood. I use a vacuum sealer for breaking down large packs of meats etc since there's usually just me here at the Boars Nest. I wash and rinse the bigger ones and reuse to store dampened Hickory Chips. That way I've always got them on hand plus I've been known to space off getting them dampened the day before I'll need them. 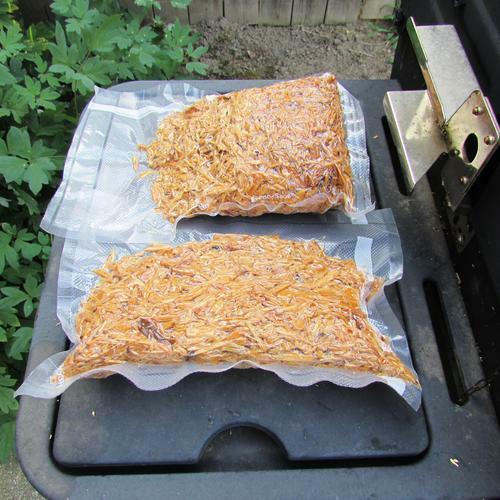 NOTE: When it comes to the 'Low and Slow' there is a point of diminishing return as if you keep the temps too low for too long you'll dry the product out just as if you were making jerky. Hirlau, Speedster, OCDshaver and 5 others like this. There should be a smoked meat section to the BST. I'm drooling over here! Just be thankful that there's no such thing as 'Smell-a-Post'!!! dinnermint, Benz, xiaotuzi and 1 others like this. 32t, xiaotuzi and Dlb1963 like this.